At Competition Transmission and Converters, LLC we offer a full line of transmissions from street/strip and heavy duty use to circle track and full dragstrip mode. We can custom build your transmission for any application desired. Street/Strip or Heavy Duty: This is the entry level transmission for the performance enthusiast. By strengthening internal components and adding throttle responsive shift kits, our Street/Strip transmissions offer superior performance over OEM design. Full Competition: This line of transmissions is for the dedicated racer. For street, circle track, or dragstrip use it offers the internal strength of our Street/Strip units but with a fully manual controlled valve body. With full line pressure at all time, the Full Competition offers the firmest shift with you having complete control. 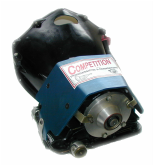 Full Competition w/ Brake: The ultimate in drag racing automatic transmission. With the strongest internal parts available, this fully manual transmission comes equipped with a Trans-Brake for the fastest release from the starting line. Circle Track : With a 1.82 low gear ratio standard, our Circle Track Powerglides are a full manual shift unit with with low drag componants. With lightweight modifications also available, our Circle Track Powerglides can provide first place performance for your race team. Street / Strip : These transmissions include a machined direct clutch pack for extra clutches and greater strength. Also included is a hardened intermediate sprag race and shift kit. This transmission ideal for street rods and weekend racers. Full Competition : A race oriented line of 350's. These forward or reverse pattern full manual transmissions give you complete control. We also offer options of a trans-brake, a variety of low gear sets, an extreme duty direct drum with 36-element intermediate sprag, and a needle bearing and lightweight kit. Street / Strip : These manual/automatic transmission include a 34-element sprag as well as extra clutches and shift kit. Available in Heavy duty form as well for towing, these transmissions are ideal for heavier cars and higher horsepower. Full Competition : This line of 400's are available with either a forward or reverse pattern valve body to give you full control. With a standard rear bearing, low gear sets and lightweight options available, these 400's offer top performance for your race car. With a trans-brake also available, these full manual 400's can suit a wide variety of needs. ﻿﻿We have not forgotten the overdrive units. In all of these transmissions, we offer a Street/Strip unit that will satisfy your street cruiser. In all applications, clutches are added and shift kits installed along with modifications unique to each unit to give you the performance you want while maintaining the overdrive capabilities. And all of these transmissions come Dyno tested and ready to install. Also ask about our complete line of high stall lock-up converters to accompany our Street/Strip overdrive transmissions. Street / Strip : These completely blueprinted transmissions are made for the Ford street enthusiast. With extra cluthes added and clearanced and reprogrammed valve body these transmission retain all automatic functions while being able to manually control if desired. In these applications, full kickdown linkage is required for the transmission to work properly. Full Competition : Available in reverse pattern, these transmissions give you full manual control. With options available such as a roller bearing assembly, lightweight parts, and a trans-brake available as well as a variety of gear sets. Street / Strip - These torque-flite transmissions have a crisp shift but maintain full street capabilities. With cluches added to high gear, improved ratio arm for intermediate apply, and throttle responsive shift kit to gain maximum performance from your street rod. In these applications, full kickdown linkage is required for the transmission to work properly. Full Competition - Available in reverse pattern, these transmissions give you full control with the tightest two-three shift around. With options available such as a bolt-in sprag, trans-brake, wide gear ratios, and complete roller assemblies we can assemble a torque-flite to fit any need.